I’ve made this several times, and each time I add something different, and change it up. It’s so versatile and can be used in so many different ways. I enjoy this as a simple bowl of goodness with a piece of naan bread and a dollop of yogurt and chutney. This also makes amazing leftovers so keep them to eat them! The recipe itself serves about 4. Enjoy. Chop up the potatoes and add to a large saucepan with the lentils, cumin, half the ginger, coriander, turmeric and water. Bring to a boil, and then turn down to a gentle simmer and cover. While that’s cooking, chop/dice the eggplant, onion, green pepper, chilli. In a pan big enough to hold all the veggies, heat the butter until melted and add the chopped vegetables, and crush in the garlic. Stir around until veggies become fragrant and then add the curry paste, fenugreek seeds, and remaining ginger, continuously stirring. Once the veggies have softened, add them to the lentils and potatoes and stir around. You may need to add a bit of water if it’s too thick. Dice the tomatoes and toss in. Salt to taste and leave to simmer for about 10 more minutes. Serve hot with naan bread, or rice, and a dollop of chutney and yogurt. A few months ago I put together a little party and had a pulled pork roast in the oven. I made a BBQ sauce that accompanied it, and it was so delicious and I got such great reviews I have decided to post the recipe. I’m sure that a lot of Texans will find it very easy to find this type of BBQ sauce at their local shop, but here in the UK there’s nothing like it. To make it I did have to import a few secret weapons and use my secret stash of ingredients from back home. I understand that many won’t be able to get some of these ingredients, but for those who can this makes a delicious BBQ sauce and will be a hit on all of your BBQ dishes! Enjoy. Dump all these ingredients into a pan and bring up to a simmer. Not too fast or you’ll be wearing it! Simmer for about 30 minutes, taste and adjust seasoning. You might want to add more steak seasoning, or more liquid smoke depending on your tastes. Cool completely and put into a jar, will last in the fridge several months sealed properly. I would add equal portions of these and adjust as necessary. Good luck! I have made this recipe before, but I wanted to make an original version without any subsitutions because the previous recipe was made with reduced fat sausage and brown rice. Which is wonderful, but I was interested in the original version for this recipe. It’s a very large recipe so I cut it in half, if you want to feed a crowd I would suggest doubling it, and you might even have leftovers for the fridge! I like my jambalaya spicy, but you can add any level of spice that you prefer. Also I know that in the US it might be harder to get hold of Spanish chorizo, just use any pork sausage smoked with a lot of flavour. Enjoy! Dice onions, peppers, chicken and chorizo. Crush the garlic and set aside separately. Slice the spring onions and halve the cherry tomatoes and set aside. In a large deep pan heat the oil until hot, and then add the chicken and chorizo. Stir constantly about 5 minutes. To that add the brown sugar and garlic, stirring continuously. 3 minutes. Next add the peppers and onion stir around for a further 3 minutes. Next add the rice and 1 tbsp. paprika, stir until incorporated. Add cayenne, salt, chicken stock cube, Cajun seasoning, remaining 1 tbsp. paprika and 2 cups of water. Bring up to a boil, then turn down to low heat and cover for about 15 minutes. After 15 minutes check for doneness, you might need to add a little more water. Add the more than half the spring onions and half the cherry tomatoes (leave some for garnish), cover for a further 5 minutes. Adjust seasoning and stir thoroughly. Serve immediately. Note: This is a great recipe with shrimp as well! Who doesn’t love meatloaf? I certainly do, and it’s so easy to make. It’s a great week night meal, and makes excellent leftovers. I’m not a huge fan of leftovers but I will always make a meatloaf sandwich! I used turkey breast mince for this but you can use any type of mince you want. 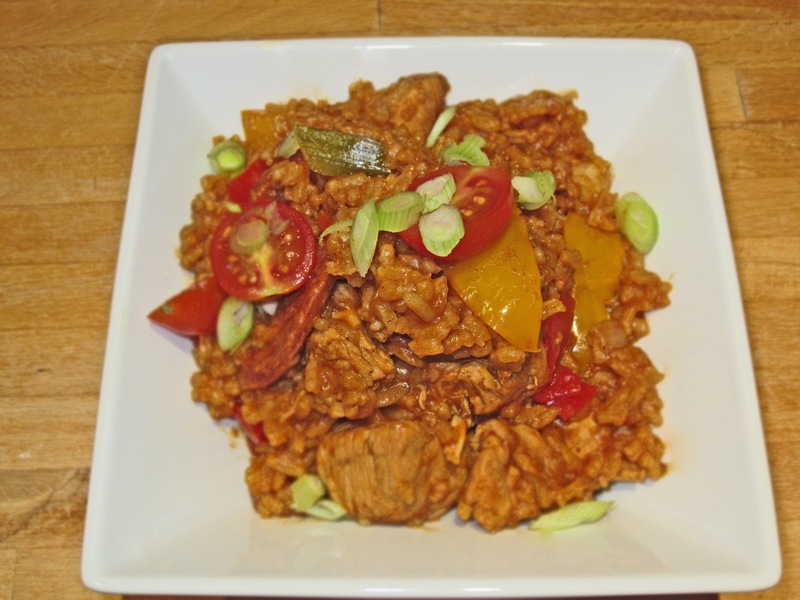 I personally find that using turkey breast tastes better and doesn’t make you feel as weighed down as beef or pork, combined with the bulgar wheat that I added it just keeps it lighter. This easily serves 4, and will make leftovers as well. In a large bowl combine all ingredients except the BBQ sauce (mixing with hands is best!). In a small oven dish, place the meatloaf mixture in and spread it out. Pour the BBQ sauce on top and spread around creating an even layer. Pop in the oven and bake for 35-45 minutes. You’ll know it’s done because the meat will pull away from the sides and be bubbly in the middle. I’ve really wanted to try to do a jerk marinade because I absolutely love sweet and savoury flavours. Although I haven’t eaten a whole lot of Caribbean food, I have taken inspiration from a jerk seasoning and made my own. It’s not something you have to make yourself but it’s a fun extra step. You can also use a marinade and jazz it up a little with fresh ginger and spices to wake up the flavours. Also I’m sure this dish could go well with chicken legs as well, I just happened to have the duck legs around. I love the rice and peas as a side dish, it’s just rice cooked in coconut milk with some kidney beans mixed in. Really delicious and easy to make! The marinade is easily enough for 4 legs. Enjoy! Put every ingredient (except duck legs) into a food processor or blender, don’t worry about peeling anything. Blitz it up until it’s a fine puree. Stab the legs a few times with a knife or fork, and pour marinade over legs. Ideally a zip lock bag. Store in the fridge for at least 2hrs but the longer the better. Preheat oven to 190C or 375F. Place legs in a small roasting tin and pour a small portion of the marinade over the legs. Cover with foil and bake 1hr. Uncover the foil and let bake for a further 15 minutes. Bring rice, coconut milk and water up to a boil. Turn down to low heat and simmer for about 15 minutes. Drain and rinse the kidney beans and add to the rice when soft and cooked. Chop green onions and add to rice and bean mixture. Serve warm with the roasted duck legs. I decided to blog about these cookies because they came out so good. I have made this recipe before based on another online recipe, but I altered it to make it my own of course. These are so easy and fast to make, it took me twenty minutes in all to whip them up. My neighbour had a birthday and I wanted to give her a little something. This was the perfect recipe, as it only yields about eight cookies. So they are perfect if you just are hankering for something sweet, but don’t want 50 cookies staring you in the face! These cookies are everything you want in a cookie, thick, chewy and not too sweet. Enjoy! I generally start by mixing up the egg, sugar and vanilla until smooth next all of the dry ingredients. Add the raisins and chocolate last. Preheat an oven to 175C or 350F and bake these for about 10-15 minutes. I give such a big time frame because I personally like mine at about 13 minutes but it might be too soft for someone else. Cool on a rack and serve warm! Note: You can use any type of chocolate, but this is the kind I used. These also can have ½ c. walnuts added without the chocolate if you just want oatmeal raisin! This is just my recipe for pinto beans, and one of my most requested recipes. This recipe can also be borracho beans, which are traditionally with beer, but I generally prefer without, but still love all of the peppers and onions added to the beans. It just adds a different flavour that I think adds a lot of depth. There are so many things to do with the beans after they’re done cooking so I made a section at the bottom with a few ideas in case you’re stumped for ideas! This will feed a giant crowd, and can also be cut in half for practicality if you don’t have a large pot. Enjoy! Rinse the beans until nice and clean and pick out any stones or anything else foreign. Place the beans in a large pot of water, cover them by at least 3-4 inches. Turn on the heat to high. Chop onions, chillies, bacon, bell pepper, and garlic. Add to the pan along with the pepper. Bring to a boil and then turn down to a low simmer for about 2.5-4hrs. They are ready to test at about 2.5hrs and cook to your desired softness. You can now add salt to taste, as well as the tomatoes. Add handful of chopped coriander when you take it off the heat. You can do so many things with these beans. Eat them as a ‘soup’. Mash them up and make a bean dip. Mash and make ‘refried beans’. Have as a side dish to any meat. Freeze what you won’t use in 2 days. It will be good for several months in the freezer. Note: As a general rule it’s important not to salt beans at the start of cooking. Waiting until the end lends a softer bean and more flavorful in my opinion. I absolutely love this recipe for when strawberries are in season as they are now. I can’t get good angel food cake to make my mom’s strawberry shortcake so my default is the bisquick biscuits! This is definitely a classic betty crocker recipe, but as usual I always try to put a little spin on it to make it special, and go that extra mile to make it taste delicious. You can make as many or as little biscuits as you want, what you do is follow the bisquick biscuit recipe for however many you are going to need. I cut mine in half so I could make two giant biscuits. For the British cooks, you they have bisquick now, and I just looked and it’s now actually called Bisquick too! This serves two very large portions, but you can adjust as you like! Enjoy! Remove all of the stems from the strawberries and slice. Add the sugar and balsamic vinegar, and stir to combine. Set aside while you’re tending to the other items. Give them at least 20-30 minutes to macerate. For the cream, add the sugar and whip either by hand or in a food processor until thick and gorgeous. Preheat the oven 220C (or 450F). To the flour add sugar and cinnamon, mix thoroughly. Slowly add half of the milk and stir, add more gradually a little at a time, you want it to form a dough, and not be too wet or sticky. Place on a floured surface and roll into a ball and pat down until it’s about 2 inches thick, take a glass or biscuit cutter and cut out a biscuit, mix the dough together and repeat for the second biscuit. Place in the oven for about 8-10 minutes until golden brown. When the biscuits are all done pop them open, spread some thick cream on top, then add the strawberries making sure to get the juice on the biscuits. Add some cream on top and you’re ready to go!